We created MyPath Advocates (formerly New ERA) because we believe youth have the right to participate in the decision-making that affects their lives, their families and communities. MyPath Advocates supports low-income youth to become active participants and leaders in the financial justice movement, helping to (re)shape the landscape of opportunity for themselves and their communities. Our youth advocates have led campaigns in San Francisco and beyond both to combat payday lenders and to advocate for increased access to quality financial services for low-income youth and families. 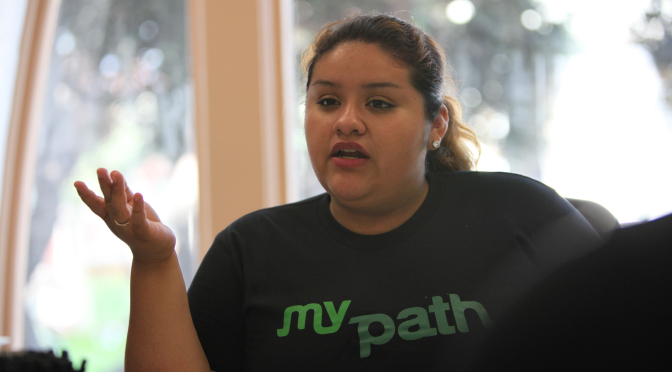 In 2013, MyPath Advocates teamed up with youth from Youth Leadership Institute to organize the first School for Economic Justice for Bay Area youth. The three-day School prepares youth to mobilize their peers and communities around policies and campaigns addressing financial inclusion. Graduates of the 2014 School achieved policy wins in Daly City and South San Francisco. MyPath Advocates have played an active role in advocacy with the Consumer Financial Protection Bureau and the California State Legislature. For more information about MyPath Advocates, please contact Dairo Romero. Learn more about MyPath Advocates’ groundbreaking results. Learn more about our amazing funders and partners that make it possible.